To Cite: Mohammadi P , Lotfi S , Moussavi S P , Mousazadeh M , Rostami R. Studying Quality of Drinking Water and Determining Sustainable Indicators for Water Resources of Villages of Harsin Town of Iran, Int J Health Life Sci. 2018 ; 4(2):e83508. doi: 10.5812/ijhls.83508. Background: Scale formation and corrosion continue to cause mild and serious problems in water dispensing systems. Although there are advanced technologies available today, such problems still persist and can lead to health problems and financial damage. Objectives: To delve into this matter, the present study aimed to determine the water potential in terms of scale formation and corrosion in the water resources of villages in the vicinity Harsin town in Iran. Furthermore, the physical and chemical qualities of the water were also studied. Methods: For this descriptive study, samples were prepared from 19 villages during the 8 months of the study duration. These were analyzed according to standard 1053 of Iran water standard and study institution, also calculated for Langelier, Rayzner, Puckorius and aggressive indices for scale formation and corrosion. Results: Indices were 0.80 on Langelier, 6.68 on Rayzner, 10.92 on aggressiveness, and 6.85 on Puckorius calculations. Mean concentrations of calcium, magnesium, fluoride, and ammonium were respectively 63.8 ± 16.89, 21.1 ± 9.08, 0.3 ± 0.26, and 0 ± 0.01 milligram per liter which are reasonable according to national standards. Conclusions: Findings revealed that all physical and chemical indices, and cations and anions of water samples were within a reasonable range. Other parameters involved in causing hardness were also at standard levels. The water resources of Harsin town were healthy in terms of scale formation and corrosion verification, but they still needed close attention in order to keep them within the current appropriate conditions with possible improvements. Talking about factors affecting financial growth, water can be considered a priority. Owing to the importance of water, measurements have been conducted not only to scrutinize water quality and quantity, but also to optimize water consumption (1). Among the mentioned items, water quality verifications must be seriously considered in planning programs for water asset management and other management activities. Nevertheless, failures can be seen in this significant area (2, 3). Some water resources are non-renewable and hidden. This is why certain problems like contaminations are exacerbated and can cause a reduction in water applicability verification in the long term. Another problem is rooted in the water chemical quality which can cause scale formation and corrosion in treatment equipment and infrastructures (4, 5). Corrosion is a physical-chemical reaction which is the consequence of exposure to the environment and can cause a plethora of changes in materials verification. According to the verified definition of this phenomenon in material engineering, it is considered a consequence of ablation or electrochemical reactions (6). Another effect of water from generation to consumption would be scale formation. In this process, double-capacity cations such as calcium and magnesium react with other dissolved materials in water to form layers of scales on the inner walls of pipes. One such common layer is calcium carbonate which is considered an indicator in determining scale formation (7, 8). Potable water and other types of usable water in industry and agribusiness should be non-corrosive in order to be considered appropriate by valid universal standards. Thus, this factor must be controlled according to standards regularly on a yearly basis. What makes scale formation notoriously highlighted is a deficiency of boilers and industrial equipment owing to this phenomenon. Furthermore, it can shorten the life of water dispensing systems or even deteriorate their function (9). The dire consequences of scale formation and corrosion include pipes blockages, reduction in water flow, unexpected flaws in pipes, and decay in the inner walls of pipes. In all the cases, large amounts of water can be wasted (10). Studying measured concentrations and statistic indices can clarify reasons for disorders in dispensing systems. Shams et al. studied corrosion and scale formation in the rural dispensing network of Tabas in 2012. They found the water in this town to be corrosive due to sulfate and chloride anions (11). Langelier saturation index (LSI) is a model that indicates water saturation level of calcium carbonate. This index defines the concept of saturation through pH as a main changeable factor. In other words, LSI can be described as pH changes required to bring water to equilibrium (12). Rayzner sustainability index (RSI) reveals the correlation between the saturated state of calcium carbonate and formation of scale layers. In RSI, pHs is determined by considering factual pH, calcium and bicarbonate ion concentrations, total dissolved solids, and temperature (13). In other words, LSI and RSI indicate the difference between factual pH and saturated pH, caused by calcium carbonate, in water (14). Aggressive index (AI) is mostly used for asbestos cement pipes. It studied the impacts of some items such as pH, calcium concentrations, and alkalinity on water corrosion and scale formation quality. Puckorius scaling index (PSI) shows the buffering capacity of water and represents maximum possible scale formation to reach a balanced state. PI is experimental. Values obtained in this equation are similar to the Rayzner index (15, 16). It is practically hard to provide sufficient highly-quality water for people (urban and rural) year-round. Therefore, the present study as a research project can be applied by water institutions. The present study determined the physical-chemical parameters of underground water resources in the villages around Harsin town. It can prevent a waste of time and money. Furthermore, underground water resources with reasonable quality can be found and offered as a database to officials in order to preserve them. To this end, physical and chemical properties of underground water resources in villages near Harsin town were compared and analyzed. They were also studied according to the Langelier, Rayzner, Puckorius, and aggressive indices. Harsin town is located in eastern Kermanshah (Kermanshah province). Its central district is Harsin, with totally 1005 square meters surface area. The town has 2 districts (Bistoon and Central), 4 main villages, and 129 smaller villages. It is situated 44 kilometers from Kermanshah. Its precise location is shown in Figure 1 and Table 1. This descriptive study examined and analyzed 19 water resources in Harsin town in terms of physical and chemical indices over a period of 6 months. Sampling was done in summer and autumn of 2015 from wells by turning on discharge taps, and from subterranean resources by opening manholes. Plastic containers with a 0.5 liter capacity were used for this purpose. Preparing the samples and transporting them to the central laboratory was done according to focused parameters. The pH levels were measured in the sampling area with a pH-meter (Model, company, country). To calculate the corrosion indices, samples from 54 water resources were collected in the villages of Kermanshah province, and stored and transferred to the laboratory in autumn according to standard methods and water quality parameters. Methods and laboratory devices used in this study are summarized in Table 2 (16). The accuracy of indices was estimated according to their capacity in determining states such as under-saturated, saturated, and over-saturated calcium carbonate. These included the LSI, RSI, PSI, and AI indices which were calculated according to the aforementioned parameters in Table 3 (17). By comparing results, water resources were divided into the 3 categories of highly-formed scale, neutral, and corrosive. The data was reported as descriptive statistic figures and analyzed in Excel software version 2007. Measured physical and chemical parameters in water such as turbidity, pH, TDS, total hardness, alkalinity, and EC are presented in Table 4 as mean and standard deviation. The cationic and anionic conditions of water in Harsin town are presented in Table 5. The relevant obtained data is presented in Table 6 separately. According to findings, LSI was the highest in Gheisvand village (LSI = 1.39) and the least in Zolmabad village (LSI = 0.37). 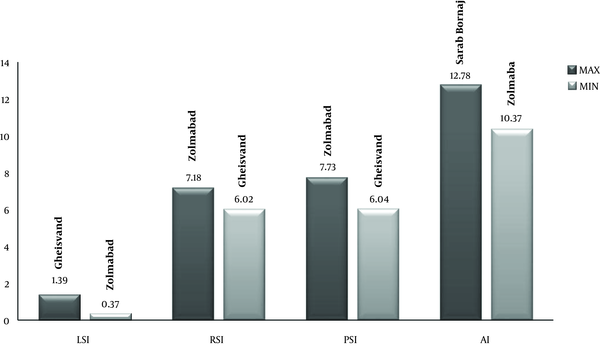 RSI was the highest in Zolmabad (RSI = 7.18) and the lowest in Gheisvand (RSI = 6.02). PSI was the highest in Pariveh village (PSI = 7.73) and the lowest in Garmyanak (PSI = 6.04). AI was the highest in Sarab Bornaj (AI = 12.78) and the lowest in Zolmabad (AI = 10.37) (Figure 2). A large population and over-crowdedness highlighted the importance of studying cleanliness indices in Harsin town. According to Table 4, the mean pH in the study areas was 8.3, which is reasonable according to national standards for permitted levels and pleasant levels (6.5 - 9). Water TDS was at appropriate levels with the exception of water in Blueredy and Elyasvand which were over the standard levels (16-18). Comparing data revealed that turbidity in 58% of water resources in the study area was higher than pleasant levels but still within permitted levels. The only exception was the water acquired from Chehr village where this parameter was much higher than permitted levels, 8.19 NTU, due to the chemical qualities of the aquifer. Total hardness mean was higher than permitted levels in 84% of water resources in villages in the vicinity of Harsin town, but this was still within the permitted range of national standards (16, 18). The highest hardness with 359.9 (mg CaCO3/L) was in Elyasvand village, and the lowest hardness with 185 (mg CaCO3/L) was in Sarab Bornaj (Table 4). This level of hardness in water resources can cause problems like blockages in house pipes or even the dispensing system network. High rates of hardness can be rooted in the type of water resources and also the existence of calcareous layers in these resources. A look at the geology and lithology aspects of the region shows that the northern altitudes of the neighboring Sahneh savannah are schist formations. Thus, they have no appropriate hydrodynamic properties due to impermeability and immovability, flowing water along fractions and breaks. Due to the formation of calcareous layers over schist formations, existing water in the calcareous layers springs out under appropriate geological conditions. This water flows along syncline channels from the schists and valleys to savannas. Then, groundwater is recharged once it is joined by this surface water. Aquifers form in savannas and alluviums. Therefore, this is the underlying cause of water hardness (19, 20). In the present study, alkalinity was within the permitted range, with the exception of Elyasvand village where this parameter was close to permitted levels of 324 mg CaCO3/L (Table 4). Thus, it needed closer control and improvement. Moreover, mean and standard deviation of other parameters of cations and anions were within the permitted range. Therefore, this was not a threat to human health and water dispensing quality. Electrical connectivity (EC) in 74% of water resources in villages in the vicinity of Harsin was over pleasant levels, but no one broke the permitted levels (10). In a study by Rajaei et al. titled ‘Studying drinking water quality of Birjand and Ghaen savannas’, it was shown that hardness, sulfate, sodium, chloride, and EC were over national standards with 25%, 33%, 70%, 25%, and 51% respectively (21). As in the present study, all parameters were within pleasant and permitted standard ranges. According to Table 6, scale formation and corrosion indices of Harsin town water resources were 0.8 for LSI, 6.85 for RSI, 10.92 for AI, and 6.85 for PSI. It revealed that the water resources of Harsin town were highly likely to sediment with regard to LSI, and corrosive with regard to PSI. RSI and AI were within the neutral range. A study by Khademian Ghadekolai et al. revealed that mean and standard deviation were 0.052 and 0.438 for LSI, 6.99 and 0.785 for RSI, 11.90 and 0.5 for PSI, and 5.85 and 0.81 for AI. According to the results, drinking water in Ghaemshahr was highly likely to sediment (22). Yousefi et al. studied drinking water of Jolfa, reported LSI, RSI, PSI and AI respectively as 1.15 (± 0.43), 6.92 (± 0.54), 6.42 (± 0.9), and 12.79 (+ 0.47). Data revealed that the well water in this study was corrosive (23). In the Arko study on the scale formation capacity of underground water in a district in Turkey (related to 12 wells), results showed that water was not corrosive, with one exception due to high sulfate concentrations. Emphasis was also placed on the connectivity in changes between underground water height and CO2 concentrations (and consequently corrosion) (24). The cations, anions, and physical and chemical indices of water resources in half the villages in the vicinity of Harsin town were within pleasant levels. Hardness parameters were within permitted levels. Indices related to scale formation and corrosion, regarding Langelier index, were mostly probable to form scales. The Pockurius index was corrosive. Rayzner and aggressiveness indices were neutral. Since water resources in Harsin town had a poor scale formation and corrosion capacity, finally, more precision was recommended in selecting pipes and other network dispensing equipment. Funding/Support: This study was provided by Kermanshah University of Medical Sciences. 1. Pal DK, Bhattacharyya T, Ray SK, Chandran P, Srivastava P, Durge SL, et al. Significance of soil modifiers (Ca-zeolites and gypsum) in naturally degraded vertisols of the peninsular India in redefining the sodic soils. Geoderma. 2006;136(1-2):210-28. doi: 10.1016/j.geoderma.2006.03.020. 2. Khadam IM, Kaluarachchi JJ. Water quality modeling under hydrologic variability and parameter uncertainty using erosion-scaled export coefficients. J Hydrology. 2006;330(1-2):354-67. doi: 10.1016/j.jhydrol.2006.03.033. 3. Elshorbagy A, Ormsbee L. Object-oriented modeling approach to surface water quality management. Environ Modell Softw. 2006;21(5):689-98. doi: 10.1016/j.envsoft.2005.02.001. 4. Nan Bakhsh H. [Chemical and microbial quality of drinking water sources Urmia in 1379]. Urumia Med J. 2003;11(6):41-50. Persian. 5. Setare P, Ahmadi E. [Analysis of the chemical quality of groundwater resources using software Aq.Qa (prairie Songhor village of Kermanshah)]. Fourth Conference on Environmental Health. 2011:123-9. Persian. 6. Mokhtari SA, Alighadri M, Hazrati S, Sadeghi H, Gharari N, Ghorbani L. [Evaluation of corrosion and precipitation potential in Ardebil drinking water distribution system by using Langelier and Ryznar indexes]. J Health. 2010;1(1):14-23. Persian. 7. Yousefi M, Saleh HN, Mahvi AH, Alimohammadi M, Nabizadeh R, Mohammadi AA. Data on corrosion and scaling potential of drinking water resources using stability indices in Jolfa, East Azerbaijan, Iran. Data Brief. 2018;16:724-31. doi: 10.1016/j.dib.2017.11.099. [PubMed: 29270455]. [PubMed Central: PMC5735294]. 8. Costa DD, Gomes AA, Fernandes M, Lopes da Costa Bortoluzzi R, Magalhaes MLB, Skoronski E. Using natural biomass microorganisms for drinking water denitrification. J Environ Manage. 2018;217:520-30. doi: 10.1016/j.jenvman.2018.03.120. [PubMed: 29631241]. 9. Kurdi M, Ferdows Shahi M, Maghsoudi A. Sensitivity of corrosion and scaling indices based on ions; case study Iran. Water Qual Expo Health. 2015;7(3):363-72. doi: 10.1007/s12403-015-0156-8. 10. Bailey RT. Review: Selenium contamination, fate, and reactive transport in groundwater in relation to human health. Hydrogeol J. 2016;25(4):1191-217. doi: 10.1007/s10040-016-1506-8. 11. Shams M, Mohamadi A, Sajadi S. [Evaluation of corrosion and scaling potential of water in rural water supply distribution networks of Tabas]. Iran World Appl Sci J. 2012;17(1):141-9. Persian. 12. Rand MC, Greenberg AE, Taras MJ. Standard methods for the examination of water and wastewater. 1nd ed. USA: American Public Health Association; 2005. p. 9-18. 13. Shultz CD, Bailey RT, Gates TK, Heesemann BE, Morway ED. Simulating selenium and nitrogen fate and transport in coupled stream-aquifer systems of irrigated regions. J Hydrology. 2018;560:512-29. doi: 10.1016/j.jhydrol.2018.02.027. 14. Mohammadi AA, Yousefi M, Mahvi AH. Fluoride concentration level in rural area in Poldasht city and daily fluoride intake based on drinking water consumption with temperature. Data Brief. 2017;13:312-5. doi: 10.1016/j.dib.2017.05.045. [PubMed: 28649592]. [PubMed Central: PMC5472139]. 15. Rezaei Kalantary R, Rezaei A, Ahmadi E, Ahmadi Jebelli M. [Quality evaluation and stability index determination of Qom rural drinking water resources]. J Health. 2017;1(3):9-16. Persian. 16. Eaton AD, Clesceri LS, Greenberg AE, Franson MAH. Standard methods for the examination of water and wastewater. University of Michigan: American Public Health Association; 1995. 17. Abbasnia A, Alimohammadi M, Mahvi AH, Nabizadeh R, Yousefi M, Mohammadi AA, et al. Assessment of groundwater quality and evaluation of scaling and corrosiveness potential of drinking water samples in villages of Chabahr city, Sistan and Baluchistan province in Iran. Data Brief. 2018;16:182-92. doi: 10.1016/j.dib.2017.11.003. 18. Soleimani H, Abbasnia A, Yousefi M, Mohammadi AA, Changani Khorasgani F. Data on assessment of groundwater quality for drinking and irrigation in rural area Sarpol-e Zahab city, Kermanshah province, Iran. Data Brief. 2018;17:148-56. doi: 10.1016/j.dib.2017.12.061. 19. Yousefi M, Saleh HN, Mohammadi AA, Mahvi AH, Ghadrpoori M, Suleimani H. Data on water quality index for the groundwater in rural area Neyshabur county, Razavi province, Iran. Data Brief. 2017;15:901-7. doi: 10.1016/j.dib.2017.10.052. [PubMed: 29159228]. [PubMed Central: PMC5681322]. 20. World Health Organization. Calcium and magnesium in drinking-water: Public health significance. World Health Organization; 2009. 21. Rajaei G, Mehdinejad MH, Hesari Motlagh S. [A survey of chemical quality of rural drinking water of Birjand and Qaen plains, Iran]. J Health Sys Res. 2011;7(6):18-26. Persian. 22. Khademian Ghadekolai M, Zamani M, Ghafari F, Rahimi M, Mahmoodpor S. [Evaluation of corrosion and precipitation potential in Ghaemshahr, village drinking water]. Human Env. 2016;14(4):1-7. Persian. 23. Yousefi M, Najafi Saleh H, Mahvi AH, Alimohammadi M, Nabizadeh R, Mohammadi AA. Data on corrosion and scaling potential of drinking water resources using stability indices in Jolfa, East Azerbaijan, Iran. Data Brief. 2018;16:724-31. doi: 10.1016/j.dib.2017.11.099. 24. Arko O. Assessment of scaling properties of groundwater with elevated sulfate concentration: A case study from Ergene Basin, Turkey. Arab J Geosci. 2012;6(11):4377-85. doi: 10.1007/s12517-012-0704-5.